Winter is my time to whittle away at the pile of "want to read" books that collect throughout the year. Nothing makes me forget the cold, snowy days like a warm drink, soft comforter, and a good book. This year I was able to read a number of books - the added bonus is that many are by HWA members! Here are a few that kept winter at bay for me. I promise you, this is not a quick read. In spite of the fact that I devour books, I had to slow down and enjoy this one. Kalen captures the world of the Gold Rush, with a cast of characters that are as diverse and complex as the world they lived in. Gold Rush California's notorious "Legislature of a Thousand Drinks" launches a secret consortium of frontier barons, triggering the collapse of independent mines throughout Sierra Nevada. James MacLaren, a fugitive from Scotland, embarks on a new life in California, escaping his secrets but not his hatred for the upper class. He is a man always on his guard, leery of the entitled and wary of his own temper. While raising a beautiful, headstrong daughter, and denying his love for a woman he cannot have, he champions miners in their fight against the Coleridge Sierra speculators seeking to maneuver a mining industry monopoly. San Francisco's Judge Dandridge sees himself as a man of vision. But when retributions fail in his courtroom, reparations are administered in the back rooms of vigilante justice. His venal and mercenary machinations tie him to the powerful Sam Brannan, the Chinese Tong and a shadowy control of the governorship of California. 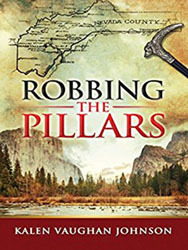 Robbing the Pillars is a story of the working class fighting for legitimacy against a legacy of gold and all it seduces - a tale of hidden pasts, love and betrayal, and the fulfillment of dreams against incredible odds. Robbing the Pillars is the first book in The Empire Barons series. One of my favorite time periods, with the added bonus of my hometown being featured. 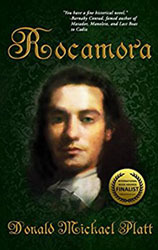 This is the first book about Rocamora by Donald Platt- and the second is already on my reading list. The depth of research alone made it worth reading! Vicente de Rocamora, the epitome of a young renaissance man in 17th century Spain, questions the goals of the Inquisition and the brutal means used by King Philip IV and the Roman Church to achieve them. Spain vows to eliminate the heretical influences attributed to Jews, Moors, and others who would taint the limpieza de sangre, purity of Spanish blood. At the insistence of his family, the handsome and charismatic Vicente enters the Dominican Order and is soon thrust into the scheming political hierarchy that rules Spain. As confessor to the king’s sister, the Infanta Doña María, and assistant to Philip’s chief minister, Olivares, Vicente ascends through the ranks and before long finds himself poised to attain not only the ambitious dreams of the Rocamora family but also—if named Spain’s Inquisitor General—to bring about an end to the atrocities committed in the name of the blood purity laws. The resourceful young man must survive assassination attempts from a growing list of ruthless foes in both Church and court, solve a centuries-old riddle to quell rumors of his own impurity of blood, and above all, suppress his love for the seemingly unattainable Doña María. Caution: I started with this book and ended up reading five in the series. No, I'm not done with Mr. Wheeler yet. King Severn Argentine’s fearsome reputation precedes him: usurper of the throne, killer of rightful heirs, ruthless punisher of traitors. Attempting to depose him, the Duke of Kiskaddon gambles…and loses. Now the duke must atone by handing over his young son, Owen, as the king’s hostage. And should his loyalty falter again, the boy will pay with his life. Seeking allies and eluding Severn’s spies, Owen learns to survive in the court of Kingfountain. 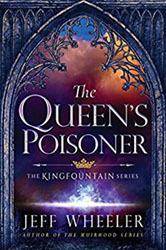 But when new evidence of his father’s betrayal threatens to seal his fate, Owen must win the vengeful king’s favor by proving his worth—through extraordinary means. 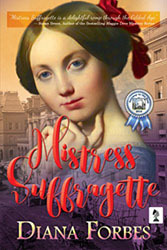 And only one person can aid his desperate cause: a mysterious woman, dwelling in secrecy, who truly wields power over life, death, and destiny. Those are just a few that I've enjoyed this Winter. Currently holding my bookmarks are Long Live the King by Guy Cote, and Last Christmas in Paris by Hazel Gaynor & Heather Webb. So, what have you read this chilly season?